Besides motorcyclists, many times it is also trucks or cars which cause the accident. Consider some of the statistics. Motorcycle accidents commonly cause severe bodily injuries and often death. Of the actual motorcycle accidents which occur, only about one biker in hundreds is able to escape with only mild bruises or abrasions. The absence of a protective buffer around both the road and the biker puts motorcyclists in rather vulnerable positions. And only a motorcycle accident attorney can protect you from making this harrowing experience even worse. There are many causes of motorcycle accidents, from which the most common one is the fact that other motorcycle drivers fail to recognize and see motorcycles in dense traffic. Many reports support this claim and motorcycle accident lawyers recommend that it is better to ride within 5 miles per hour of the speed limit and to wear appropriate protection along with a sturdy helmet to increase your odds of surviving in the case of an accident. It has been witnessed that bike riders are 27 times more likely to die as a result of the collision than are other people who are seated in the truck or car and are also 5 times more prone to suffer from bodily harm. Thus, anyone can see the disastrous effects of motorcycle-car accidents. There are also a plethora of other causative factors which happen quite frequently and result in motorcycle collisions. One of them is the motorcyclist’s negligence to decrease speed when turning or trying an under-turning along with over braking in the lane. Motorcyclists have been noted to enjoy the thrill of high speeds especially brand new riders who love exceeding speed limits. A careless slip from the handlebars or an unexpected obstacle can send the motorcyclist reeling out of control. Moreover, many inexperienced riders do not even know the constraints of their vehicle. However, even practiced and older bikers have been seen to ride past the speed limit. Besides motorcyclists, many times it is also trucks or cars which cause the accident. Since they are more likely to come out unscathed from a collision, they overlook the damages that they can bring to motorcyclist’s by speeding. In these scenarios, especially, a motorcycle accident lawyer can aid you by getting you the deserved compensation after the accident which is proportional to the injuries you suffer. Kevin J. Davidson is an experienced motorcycle accident lawyer. 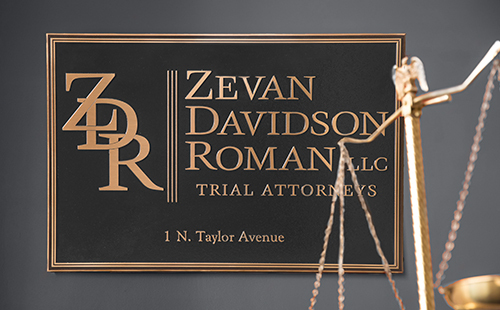 Contact the Zevan and Davidson Law Firm today to discuss your case. We look forward to speaking to you about your case.